Look, we get it—it was a big thing in the old Expanded Universe canon that Thrawn studied the art of different cultures to better understand how they thought tactically. But I think Rebels might be taking Thrawn’s artistic leanings a bit too far in this new clip. The clip, from this weekend’s upcoming episode “Hera’s Heroes,” sees a captured Hera Syndulla in Thrawn’s clutches. 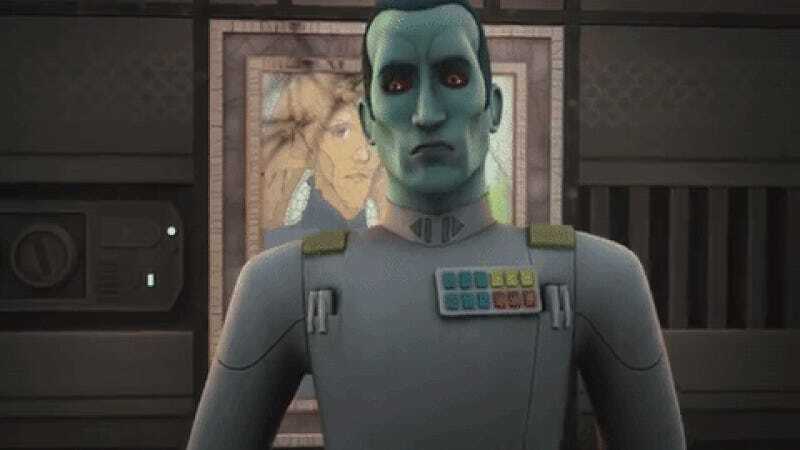 As with everything we’ve seen of the Chiss on Rebels so far, Thrawn is sinister and unnerving, declaring his new way of waging war for the Empire through artistic knowledge as he slinks around the captive Hera. And then... he reveals he knows who Hera really is because he’s been standing in front of a painting of her and her family this whole time!? I’m not sure Thrawn’s study of art is meant to give him the answers quite so literally, but I kind of love the over-the-top evil of it. It’s all well and good to see Thrawn slinking and sinister, but this sort of insanity gives a bit of fun to the character, too. I hope at some point in Rebels’ third season he trundles out a painting he found of a Star Destroyer blowing up Rebel frigates as his new battle plan. Such genius!